The Holidays is a very busy time for guitar related sites, since lot's of people get guitars for Christmas. 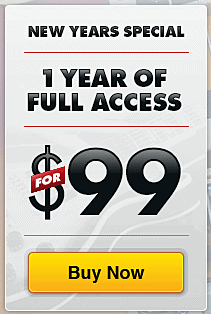 As I predicted when JamPlay started offering a Holiday discount, GuitarTricks.com has joined the lines. I didn't get an email about it from them though, I just noticed on their site. I would be so very interested in finding out how many guitars actually get purchased around Christmas time. I know that most stores have 10x turnover during the Holidays, as compared to normal periods, so I'm guessing that 10x as many guitars get bought as well. This is the most important season for GuitarTricks as well, so that's why I was pretty sure they would quickly follow JamPlay in offering a Christmas discount on their annual membership. Now both GT and JP are available for $99, which makes things interesting since there is absolutely no price difference between the 2 sites any more. If you'll remember, JamPlay is usually a bit more expensive. So with the price difference out of the way, the comparison between the 2 leading guitar sites get's even tighter. Which will you choose? Here is some help on deciding.